We're all told "you must set goals, or you won't achieve anything". Setting goals is a great idea, whether it's for your health, your business, your finances or your life. But after you've set your goals, what do you do with them? Do you pin them to your wall and look at them every day? Do you put them in a drawer and forget about them? Do you evaluate your progress every few months? If not, it's time to start! Write your goals down on a piece of paper in front of you. Ask yourself if they are long-term goals, or short-term goals. For example, "lose weight" is a long-term goal, while "finish annual report" is a short-term goal. Now if you haven’t achieved the goal, you need to ask yourself “why”? For a long-term goal like "losing weight", it's usually because you haven't created a plan for how to achieve it. And how can you plan to achieve it without the specifics? - How much weight do you want to lose? - When do you want to lose it by? Rephrase your goal to include a measurable unit of success. "Lose weight" becomes "lose 20kgs in twelve months." Your goal has instantly gone from wistful thinking to an achievable outcome. 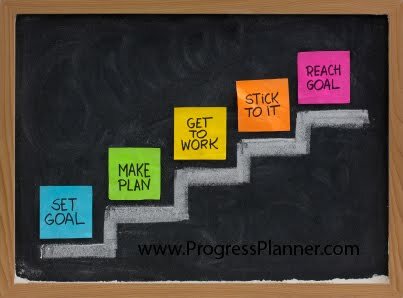 Now you need to create a series of action-steps to get you on track to completing your goal. These action steps need to be easy, quick and immediate. For example, the first action step might be "go for a run tonight" or "spend an hour at the gym". These are things you can complete right now to bring you one step closer to your goal. Every day, look at your goals and assign one action step to complete that day. Every few months, measure your progress towards your goal, and write it down too. For example, if you lose 10kg in three months, write that down, and give yourself a big congrats for being ahead of schedule. You also need to ask yourself if you're still interested in pursuing this goal. Sometimes, your situation and lifestyle can change, and a goal you were enthusiastic about six months ago no longer meets your needs. Maybe you decide instead of losing weight, you want to focus on building muscle, or, instead of starting a new business, you want to travel through South America. Learning to evaluate and shape your goals to fit your lifestyle gives you a better chance of success. So, what goals have you set yourself this year?